I was six when the Larraburu Brothers Bakery shut down. I don't recall what the bread tasted like, and I'm not even sure I ever had any. But I'm fascinated by the history and how widespread and adored this bread was. The number of loaves, the loaves shipping around the world, even to France, indicates that it wasn't just a small group of aficionados that were keen on this bread. I grew up on Colombo rolls and sliced bread, Oroweat rye, and 'artificial' sourdough baguettes from Safeway. And I always had a Boudin bread bowl with clam chowder whenever I visited San Francisco. Living in rural New Zealand, it's very hard to find San Francisco style sourdough bread. A local baker looks at me quizzically when I ask for sourdough bread that is intentionally sour. He tries to explain how people misunderstand, and that sourdough doesn't mean the bread tastes sour. I then have to counter-explain that I know this, and that bakeries in San Francisco did intentionally ramp up the sour because some people like that taste. Like many on this board I'm still searching for my perfect bread to make every weekend. I'm pretty sure it won't be a Larraburu clone, but I think I will borrow some aspects of that bread. Understanding it is still a worthwhile endeavour. Anyhow, this post is about my research into Larraburu Brothers bread, and my attempts at making it. There is a documentary in progress (still, I presume) called "Finding Larraburu": https://www.facebook.com/LarraburuBrothersBakery I don't know how it ends.. I don't know if they found the starter. Numerous posters on this board have mentioned or tried to reproduce the bread in nodes 17730, 26599, 26661, 26729, 49405, and 43065. In comparing the NYT article ['NYT'] to the Galal et all paper ['Galal'], I notice some differences, but also a lot of confirmation. Here is the superset of data from those two sources, including my take on why they conflict and how to resolve the conflicts. GALAL: Each day a piece of straight dough or starter sponge known as the "Mother" is saved and refrigerated to be used as a starter sponge the following day. NOTE: we don't know the refrigeration temperature, but we know that regular refrigeration is part of this starter's life. NYT: A baker will take about two pounds of dough for a previous day's batch, and this is the starter for the next day's run. The starter is left to rest for a few hours and is then placed in a dough mixer with salt, flour, and water. When this is blended, a sponge, as it is called in breadmaking circles, is produced. The sponge in this case weighs about 600 pounds. It is then divided into a dozen 50-pound pieces. NOTE: At 50% hydration (from Galal) this is a 1/100/200 feeding, which is quite substantial. NOTE: This is a 1/1/2 feeding, 100-fold different from the NYT article. Personally I trust researchers to get facts more correct than I do newspaper reporters who are notoriously error prone. However, the bakery did have to make a hell of a lot of bread, and the reporter specified "two pounds", "600 pounds" divided into a "dozen" "50-pound" pieces, which is all self-consistent. One way to resolve this difference is if the Galal paper had a single misprint. If it instead read "and 0.50 parts of the starter sponge" it would be exactly in line with the NYT article. Nonetheless, that is a very heavy dilution of starter material, and so I am still somewhat skeptical. NOTE: The other inconsistency is that the NYT article suggests that the sponge contains salt. The Galal paper doesn't include salt in the sponge. NYT: Each of these pieces is put back into the mixer and more flour, salt and water is added. Each of these produces about 800 pounds of dough. GALAL: The bread dough is made by mixing 100 parts of flour (12% protein), 60 parts of water, 15 parts of sponge, and 1.5-2% salt. NOTE: Based on NYT, the sponge is 0.0625% of the final dough weight. Based on Galal, the sponge is 0.0849% of the final dough weight. These values aren't too far off each other. My best guess is that the bakery in 1976 was operating on a slightly different recipe than back in 1964. And I suppose the value from 1976 by Galal is probably more reliable and/or represents improvements that the bakery made over those 12 years. GALAL: The dough rests 1 hour, and then is divided, molded, and deposited on canvas dusted with corn meal or rice flour. NYT: This dough is allowed to rest for an hour and is then molded, weighted and shaped. NOTE: nice to see some consistency here between the two accounts. NOTE: Again, nice to see some consistency here between the two accounts. NYT: When they are removed, they are left to stand for another two to three hours. GALAL: ...and baked at 420F (216 C) for 40-50 minutes in a Perkins oven with direct injection of low pressure steam (5 psi). NYT: Finally they are baked 40 minutes. So these accounts are rather consistent, and they fill in the gaps in the other's story. The biggest inconsistency is the amount of mother added to the sponge. Is it 1/1/2 or 1/100/200? I should think if it was 1/100/200, 9-10 hours at 80F would not be long enough to visually activate the sponge. So the bakers must have been working blind. It does, however, allow for a long (4 hour) hot (41C) bulk ferment. This weekend made a bread with mostly white flour, a smallish 10% sponge, and 5 hours fermenting at 39C (the hottest my incubator runs at). It worked out just fine - it may have overproofed slightly, but it still had some air and oven spring and a nice enough crumb for my tastes. I'm speculating wildly, but perhaps when you reach this scale of production, percentage figures might become deceiving. Maybe the fact that the absolute weight of the mother is two pounds, rather than just a few ounces (i.e. big enough to cut into a number of pieces and distribute, rather than just drop in), gives it an advantage - or something like that. Thanks, Mike for posting your research! How I wish I could have tasted this bread. Do you have a spreadsheet, formula and process, or a writeup of your most successful attempt? If so, I would like take a look, if you are willing? I searched, “Fnding Larraburu”. I found very little information other than the documentary trailer, which looks extremely interesting. Have you attempted to contact the movie makers? I hope you will continue to share any information with us? I haven't tried to faithfully replicate it yet. Perhaps this coming weekend. I should fork a 50% hydration starter with clear flour now, in preparation. This last weekend I did a hot ferment (39C) and then one loaf went on to proof further at 39C, the other went into the refrigerator and baked it the next day after room temp proof. So far they taste remarkably similar. I was hoping they would taste different, but I can't discern any difference. The Galal article is from a refereed scientific journal. I regard it as more credible. At the same time, the decade difference in publication dates suggests there may have been some procedural changes. A few other points: The NYT article formula for the sponge is suspect on two counts, IMO. First, if I read it correctly, they report a 1:10:20 mother: water: flour ratio. Unfortunately, they do not report how this was fermented (time and temperature). Also, their description suggests the mother is "old dough." 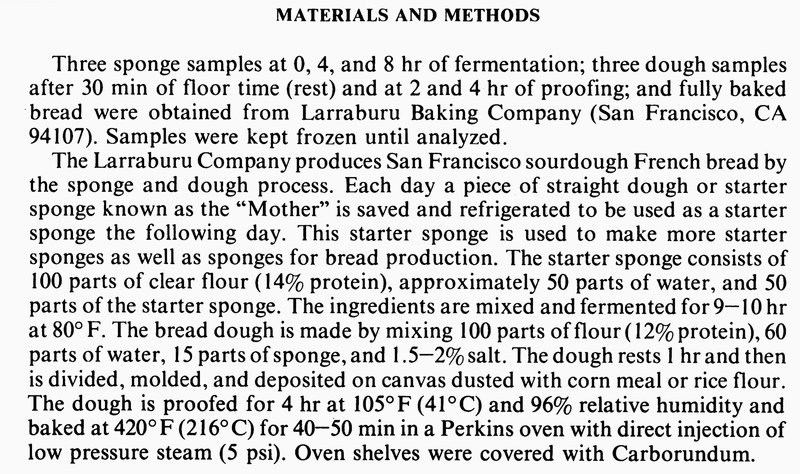 The Galal article clearly states the mother is a piece of the sponge, which unlike the "old dough" alternative, does not contain salt. The Galal sponge ingredients are 1:1:2, as the OP noted. On the other hand, Galal's sponge fermentation is rather long and hot for this ratio of ingredients ... unless they wanted the sponge super sour, which may indeed be the case. The Final Dough mix in the NYT article is a 1:5:10 ratio. No mention of salt. The Galal FD ratio is 15:60:100 with 1.5-2% salt. I think the method described in the Galal article is worth trying. If I do, I will surely report. Please help me break this down. Excerpted from the Galal paper. At the bottom is my take on the process. Please correct any errors and/or misconceptions. I am planning to try this method "soon." In anticipation, I have written up the recipe that I plan to follow with just a few minor changes from Galal. Given the interest in this method, I think I'll post the planned procedure and edit it to include my results when I have some. I’m pretty busy right now, so I won’t be trying this for a while. I’ll be watching for your documentation. Proofing at 105F for 4 hours (free form) seems sketchy. But then again the total hydration is only 59%. David - have you tried Teresa Greenway’s SFSD? I have never tasted the Larraburu bread, but the breads produced using Teresa’s formula and process is the absolute best I’ve ever tasted. Of course, that is highly subject to opinion. David, since Larraburu used no retardation, with the exception of the starter that is stored approximately 12 hours, it seems reasonable to expect a very smooth (not sharp) lactic flavored bread. Do you agree? Well, retardation in a cold environment should favor acetic acid. On the other hand, the low hydration also favors acetic acid. We'll see. I am in the process of making this. For my own convenience, I am retarding the sponge overnight and will mix the dough in the morning. Years ago, when I was first starting sourdough baking and most often making Peter Reinhart's sourdough bread, I often retarded what he (incorrectly) referred to as "barm." I believe that did result in a more sour (as in acetic acid) loaf. This sounds like a really cool exercise in culinary archeology. I can't wait to hear about the results or maybe try a little myself when I get some time :).